In this article we’ll take an example of our plugin ELEX WooCommerce DHL Express / eCommerce / Paket Shipping Plugin with Print Label and put a max shipping cost of $25 for domestic shipping and $50 for international shipment. And when you add more items the shipping cost will increase as the package weight increase as well. So in the below image you can see that when I increased the number of items in cart the shipping cost crossed the $25 restriction the shop owner wanted to set. How Can we Set The Max Shipping cost? Our developers have come with a solution where you can configure a code snippet and add it using code snippet plugin by Shea Bunge. Its a safe way to add code snippets using the plugin, instead of adding it directly to the functions.php in the theme folder. If you add code snippets in functions.php and there’s some error in the code, your whole site could crash. Hence its wise to use the code snippet plugin which you can download from the WordPress plugin repository – Download Link. You can install the plugin on your WP plugin page and to add the code go to WordPress menu >Snippets>Add New Snippet. Add the below code and save and activate. I’ve added as comments where you need to do changes according to your requirements, you need to replace the ‘TH’ with your shop’s base country code. It should be a two character code. Enter the max shipping cost you want to set for domestic and international shipping. $origin_country = 'TH'; // Configure the country code of the shop base country. $max_amount_domestic = 25; // Configure the max shipping cost for domestic shipping. 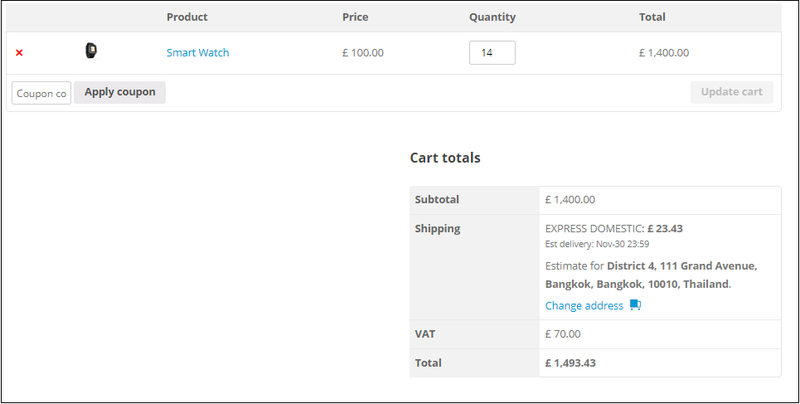 $max_amount_international = 50; // Configure the max shipping cost for International shipping. So now even if we add 100 items to cart it will still show the shipping cost as $25. Now when we try for International address with the same quantity (100), it will still show the $50 restriction we have provided in the code snippet. With this solution you can easily charge the actual shipping cost for smaller and lighter items and charge a fixed amount without allowing the shipping cost to be too high scaring most of the customers about the shipping cost. And this would attract more customers to order in bulk as well, since the shipping cost is fixed after certain cost independent of the number of products you order. Hope this article have helped you with your case. If you need help setting up the plugin and the code snippet you can always contact our team.